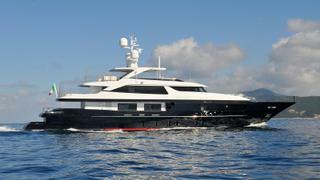 The 46 metre motor yacht Forwin, listed for sale by Simpson Marine in Hong Kong, has had a price reduction of €850,000. Built in steel and aluminium by Italian yard Sanlorenzo to a design by Franceso Paskowski, Forwin was delivered in 2013 as an SL46 Steel model and refitted in 2016. ABS classed, she accommodates 12 guests in six cabins comprising a master suite on the upper deck, a VIP suite on the main deck and two doubles and two twins below. All guest cabins have entertainment centres, Samsung television screens and en suite bathroom facilities while a further five cabins sleep nine crew aboard this yacht for sale. Like her predecessors in this series, she has all the features and details that made the first hull so successful: the stern beach club, a large lateral tender garage, a toy garage below the foredeck and the lower deck housing technical and service areas. The saloon has comfortable seating on L-shaped settees, a bar and an entertainment centre including a 46-inch Samsung television screen and a Kaleidescape server providing on-demand video and audio. More relaxation is available in the skylounge, which has been fitted with L-shaped seating, an entertainment centre and a stereo surround sound system. Relaxed dining is available at a circular glass-topped table. Both the upper and main aft decks are optimised for al fresco entertainment and dining with U-shaped seating and low tables, while the vast sun deck has a dining area for 12 guests a bar, barbecue and grill sheltered by a custom hard top. Aft is a sunbathing area including a Jacuzzi, sun pads and sun loungers. Other features include a well-equipped gym, beach club and an elevator connecting the three upper decks. Twin 2,040hp Caterpillar engines deliver a cruising speed of 15 knots topping out at 17 knots and she is fitted with Naiad zero speed stabilisers. Lying in Phuket, Thailand, Forwin is now asking €16,950,000.